When Fire Emblem Heroes was released on mobile, it isn't the kind of game that I'd actively search for but a month later with 23 hours of game time clocked in, it’s something of an addiction now. It’s not like this game made me want to spend actual money on microtransactions or the games themselves but it has given me a ton of fun on train rides and bored moments at work. 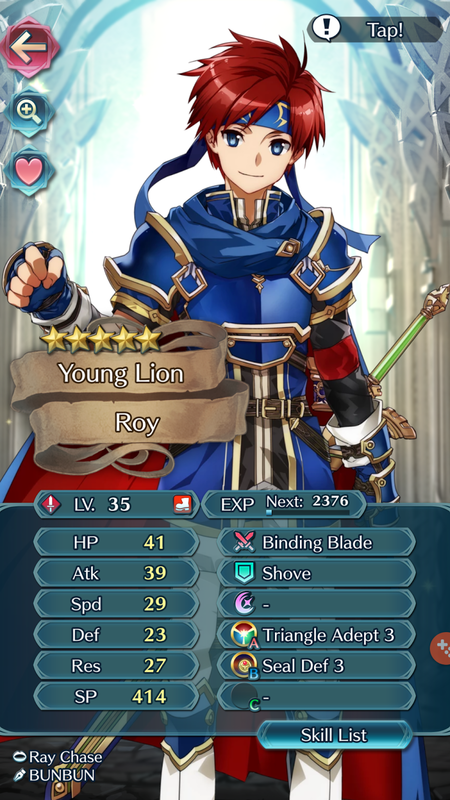 When I started this game, I was greeted with characters who I legitimately thought were from other Fire Emblem games, which shows how aware I am of this series. I've been using a team consisting of Roy and male Robin as the two big dogs that dominate. They've been competent as a duo so far. The downside of that is I have two other people that have been hit and miss in terms of reliability. Cherche and Laslow have been capable teammates when the time calls for it and when I don’t get overconfident by charging to battle with those two but I end up relying on Robin and Roy most of the time when Cherche and Laslow eventually get their jaws handed to them in battle. This is what the game is about really. Making the best team consisting of your favorite characters is one thing but utilizing them in battle effectively and dominantly is another. In my case, I'm not a huge fan of the series so I'm not aware of the characters and their stories. So going in blind, I had to make do with the characters I got. 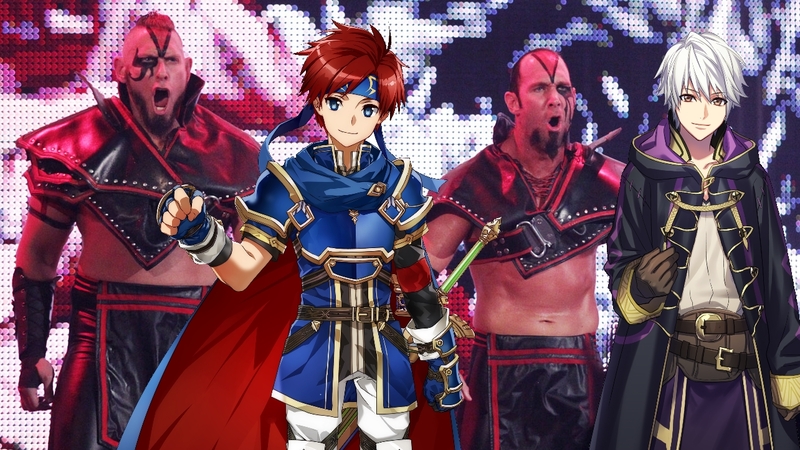 Roy and Robin are on my main team and I'm so close to calling them Roy’s Boys or, just for the sake of giggles, The Ascension. You have nine chapters which counts as the main storyline but it basically ends on a cliffhanger and beyond that is simply the same nine chapters with increased difficulty levels. Completing a chapter for the first time gets you an orb which costs money so that’s incentive to go for the higher difficulties. 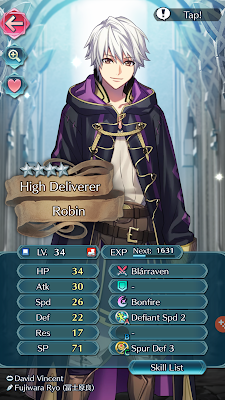 Aside from the main story, we have a training map where you can level up weaker characters and earn materials to upgrade your characters and make them stronger. It’s a good way to get more grinding done for weaker and newly upgraded characters as the choices for types and levels of enemies randomize after every battle in this mode. There’s also an arena for some simulated PVP. Each day, you get three Dueling Swords which you use for one arena fight each. This isn’t real time PVP however. The AI just controls your opponent’s team to either great results where you win or end up getting pummelled by several mages. Damn bookworms! It isn't a free-to-play game without micropayments and boy, do they get costly if you choose to go down that road. 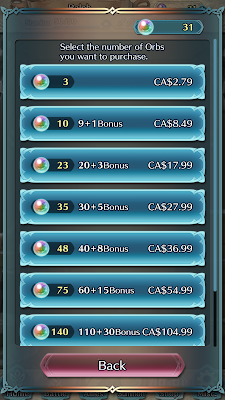 You pay real money for orbs that you use to upgrade your castle, which in turn, increases the amount of experience points you gain. 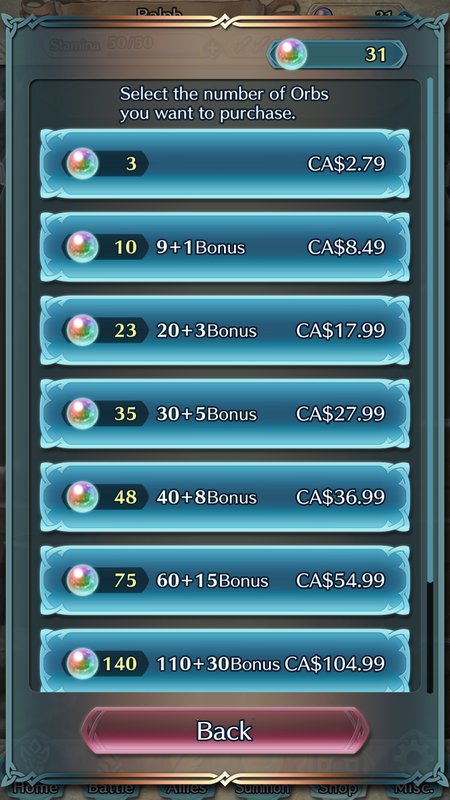 You can also use orbs to purchase random characters starting from 5 orbs. What’s terrible is that buying characters is a chore in itself. See, you don’t just get to purchase any character you'd desire like in a catalogue. There are odds to getting certain characters and certain rarities as well and the better the character, the less likely you’re going to get them immediately which means get ready to spend more money. You may get a 2 star bronze level of a character while another player gets the same character but with a 5 star silver level which has better stats and is probably going to be more useful in battle. So getting protagonists or at least characters who are popular within the fandom with decent stats would be hard to obtain without throwing money at the problem. Instead of permanent death, a defeated character would just lose the experience they gained in the map so if you had Corrin or Nino running wild in a battle but didn't think that they'd get their heads kicked in by three horse units who each had 1 health each, congratulations on losing that character's level progression, Buddy Murphy! It's not as bad as permadeath but it's still terrible consequences nonetheless. The maps are bite-sized, set in an 8 by 6 grid which makes it easier to navigate on a phone and every character is on-screen. The game tries to vary the maps with environmental aspects that affect movement so your horse troops can’t walk through trees but your pegasus knights can fly over mountains and lava pits. Some maps also have mazes in them where you have to come close to your enemies while they have long ranged attacks and mess your team’s collective jaws up. 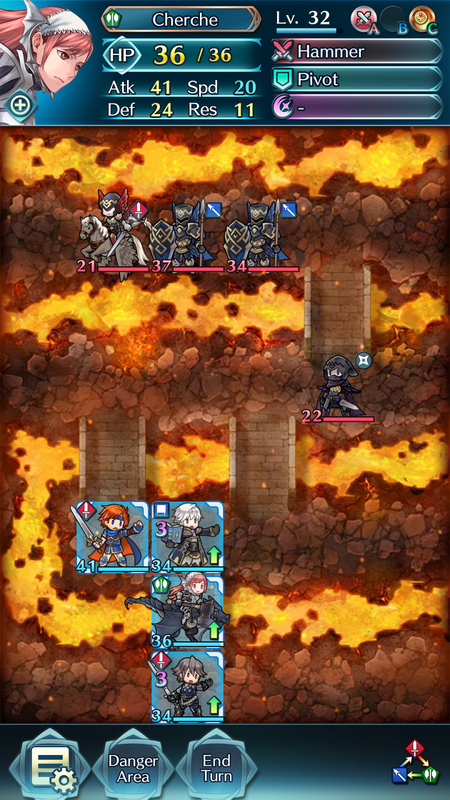 In previous Fire Emblem games though, you’re given the chance to preview the map, survey your opponents, and see what’s in store for you whether it’s an easy win or a brutal head-kicking which would require some further reorganizing of your team. However, stamina is limited as you go to further levels. You get 50 stamina permanently which means no amount of storyline progression would increase the amount of stamina you have. Later stages with higher level opponents would require at least 15 stamina to play and losing or quitting the map gets you none of the stamina back. As for the story, why do I get a feeling of Warriors Orochi here? Different characters from a series are fighting other characters from the same franchise in a war that nobody knows how to stop unless they beat the living hell out of the others. The characters mention how they have to honor a contract which I think needs a lawyer needs to assess just to check its terms and conditions. The player is then tasked with possibly collecting all of said warriors to add to their roster in order to... beat the living hell out of others. A novel idea, of course, but one of the weaker parts of the game when compared to the emotion and drama in a full-fledged Fire Emblem game, which is perfectly understandable . What exactly is the endgame of this story, really? If the characters go back to their own timelines, would they forget all of their experiences here and live life back to their original fates, making this game seem pointless? Would they simply just live in this weird new place, leaving their old lives behind? I may just be nitpicking at this point and it might just be a moo point (i.e. a cow’s opinion - it’s “moo”). To sum it up, is it fun? Definitely, despite the freemium aspects, it's fun to have a Fire Emblem game on the go that doesn't require that much thinking. Perhaps it's a way to introduce new players to the series with it being free on the most used handheld device nowadays. Once you get used to everything, perhaps the game’s main purpose is “Now that you’ve spent 30 hours on this free game on your phone, why not upgrade to the main games for another 30 hours with a more coherent storyline?” The game is definitely fun and addicting with its character collection and gameplay that's easy to grasp. It could certainly be improved in different ways such as bigger maps and better storyline but as it is right now, it definitely earns its spot in your cellphone's storage. 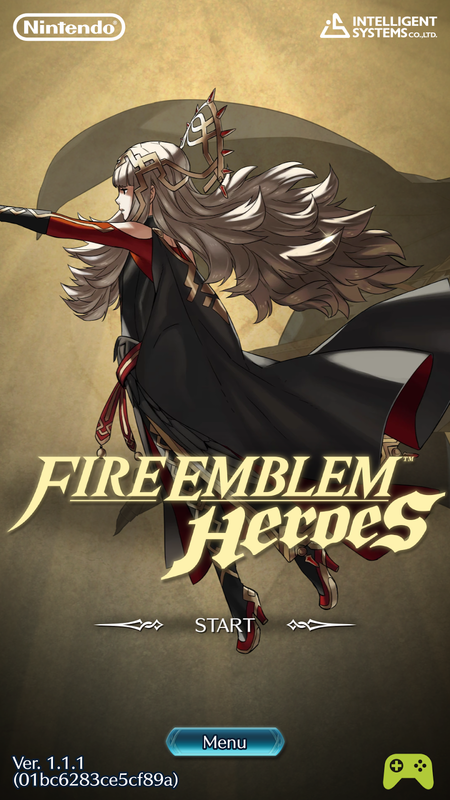 Fire Emblem Heroes is available for download on Android and iOS. Download it and create your own team of people who can slaughter a village if they had the chance to.